MIMIC explores the ability to have a background perception of another person even when they are not in the same room. 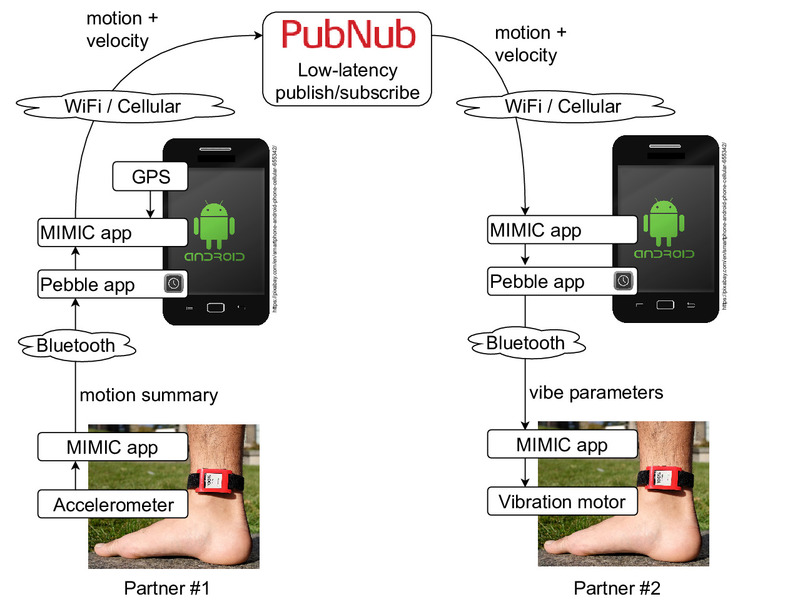 The MIMIC Android smartphone app creates a haptic connection that lets you feel your partner's state through two short vibration pulses on your ankle, representing their current activity level and the speed at which they are traveling. Coupled with existing knowledge about that person, the transitions between activities convey useful information that is both practical and can enhance the feeling of connectedness between remote people. Exploring the Limits of Vibrotactile Numeric Information Delivery Jeffrey R. Blum, Jeremy R. Cooperstock. Poster, ACM International Joint Conference on Pervasive and Ubiquitous Computing (Ubicomp) 2018, Singapore, October 8-12. Pseudo-Ambience: Filling the Gap Between Notifications and Continuous Information Displays Jeffrey R. Blum, Jeremy R. Cooperstock, Jessica Cauchard. UbiTtention Workshop, ACM International Joint Conference on Pervasive and Ubiquitous Computing (Ubicomp) 2018, Singapore, October 8-12.